Disney Parks and Resorts offer guests some of the most enticing food and drink offerings around. When I think of splurging, it usually is on dessert. A wide assortment of desserts are available, especially if you know where to look. For instance, one of the most well known desserts that is “Disney famous” are the Zebra Domes over at Animal Kingdom Lodge. These little bite sized domes are full of flavor, a mouthwatering symphony of chocolate, coffee, cream, liqueur, and a bit of sponge cake. These are available at Boma, a buffet restaurant, or at The Mara, a food court, inside Animal Kingdom Lodge. These are definitely worth trying. Some other well known desserts are the Dole Whip, the classic Mickey Ice Cream, and Candy Apples of many varieties. 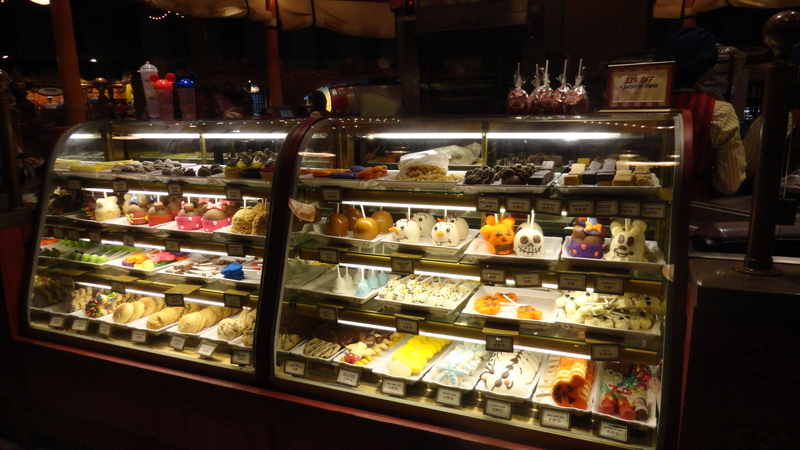 Plus, the bakery cases at Disney parks are stocked full of most anything you may want. I usually don’t splurge on these types of items although they all look so good. 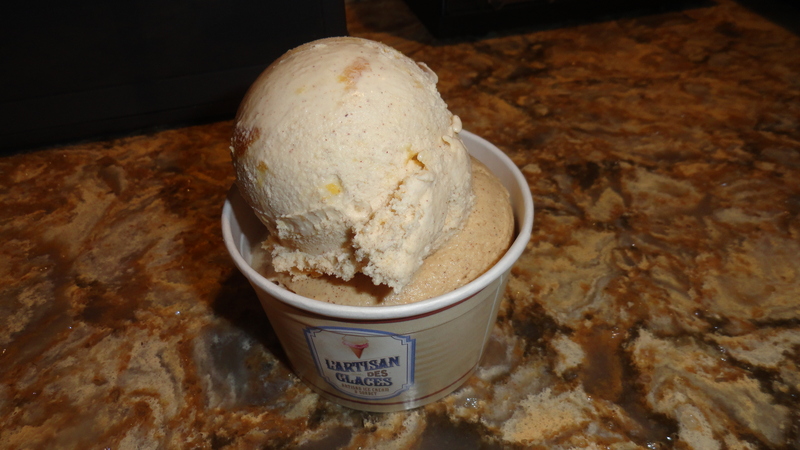 I do enjoy a freshly made ice cream from L’Artisan des Glaces. They offer changing flavors during the month, you may come in and find something completely new and different that wasn’t there before. If you are more into savory foods, you can also find some appetizing eats to tempt your taste buds. For foodies, the Epcot Food & Wine festival is a must do, with plenty of booths from around the world to try. If you happen to miss out on the Food & Wine festival don’t worry, there are plenty of good things to eat all year round. One of my favorites is the Quattro Formaggio pizza from Via Napoli, I consider this an indulgence worth having. The fish and chip shop in Epcot Britain – a little greasy but worth trying, good for sharing if you don’t want to eat a whole portion. 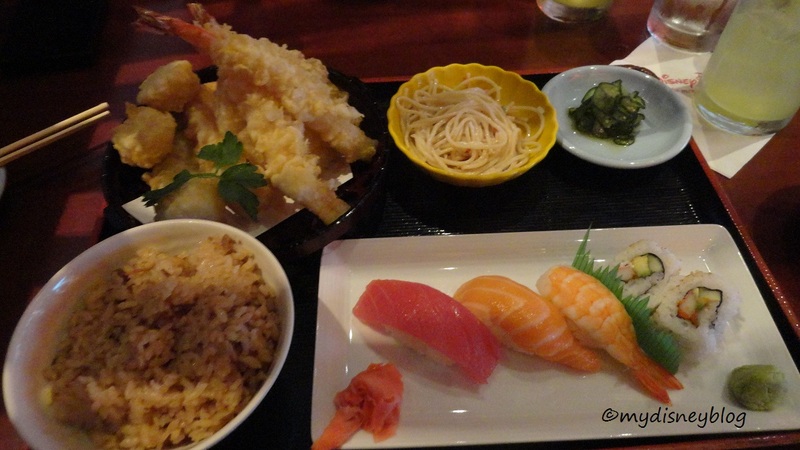 Sushi and tempura, I absolutely love eating at Toyko Dining. Many Disney restaurants offer gourmet cheese plates, especially the signature restaurants. I know many people can’t pass up ordering a fine cheese plate. This one from Artist Point was divine, every single cheese was heavenly. And don’t forget to try their Smokey Portobello Mushroom Soup, it’s amazing. 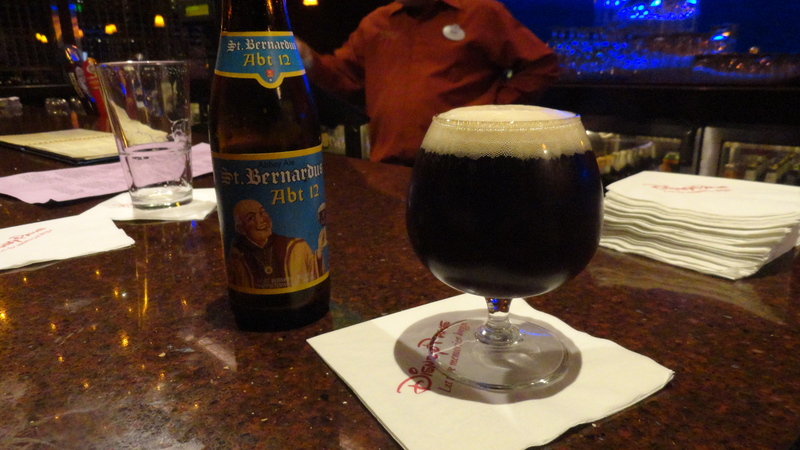 And if good beer, fine wine, or a stiff drink is your particular vice, Disney has that too. At Magic Kingdom you can order an alcoholic beverage at Be Our Guest! Many of the bars and lounges offer regional specialties or cocktails and most of them offer a selection of fine beer, wine, and spirits. For instance you can get Kona Longboard at the Polynesian, or you can get Unibroues in Epcot at the Canadian pavilion and Le Cellier. Each country in Epcot offers a variety of drinks. You can drink sake in Japan, a huge array of tequilas in Mexico, or Grand Marnier slushies in France. I can’t say what it my #1 favorite in any category, I really love it all. If you have a favorite food, drink, or dessert, that you must have when you visit Disney Parks or Resorts, please share it in the comments.